We put up and decorated our tree on Saturday. It is our favorite plastic white Martha Stewart tree we got a few years ago. In place of our usual 5 strands of lights... we went with 2. Why you ask??? Christmas lights are energy hogs and drain our batteries quickly. We would have gone with LED's, but we could not find any on white cords... not to mention our color lights (pink and orange). It's always something right? No worries - we made do and I have to say it looks better than it ever has. Have you ever noticed that the tree looks better lit up in the daytime than it does at night?... Or at least I think so. When it is lit at night the ornaments just turn to black silhouettes. What fun is that? It's almost as if you need a special light to light the lit tree. 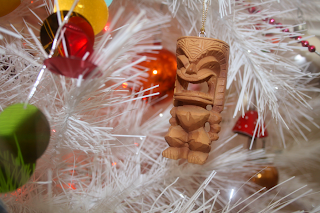 Anywho... we got some fun tiki ornaments which are the stars of the tree this year. 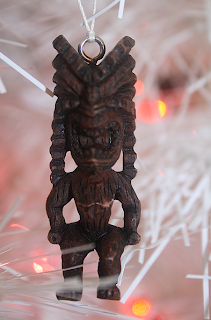 The really dark ones were key chains that I got for $1.50 each. 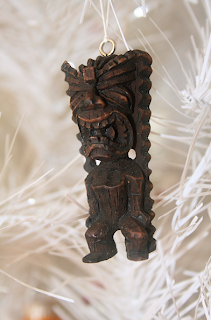 Each tiki has a special power that it provides you like... health, money, safety, success etc. Hey we need all the help we can get right? 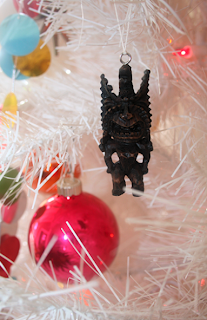 Who says ornaments have to be from the ornament department? 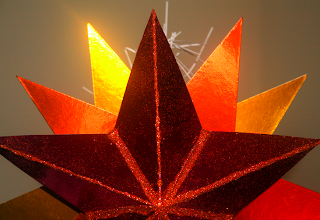 John made the perfect bright and sparkley 3-d star topper in pink, orange and gold metallics. And a touch of glitter too boot. I'm also really into this glass orchid which fits right in with the tropical tiki's. 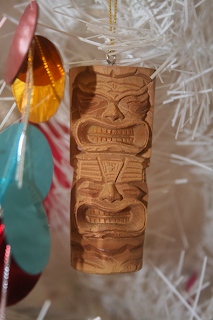 The tiki ornaments are fabulous - I just about screamed. 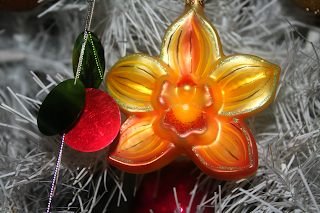 They look so incongruous and at the same time so very perfect against the white backdrop of your MS tree! 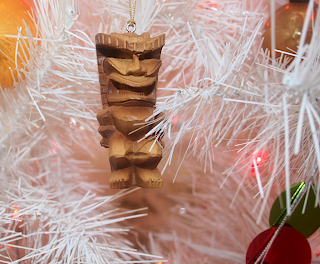 The tree topper is to die for.